Railpictures.ca - A.W. Mooney Photo: CP Budds 9250 and 9024, tri-weekly #185, seen here at a station stop in Chapleau on their run from Sudbury to White River in this pre-VIA image. The train has just left the Nemegos Sub and is about to enter the White River Subdivision to the town of same name 130 miles down the line. | Railpictures.ca – Canadian Railway Photography – photographie ferroviaire Canadienne. 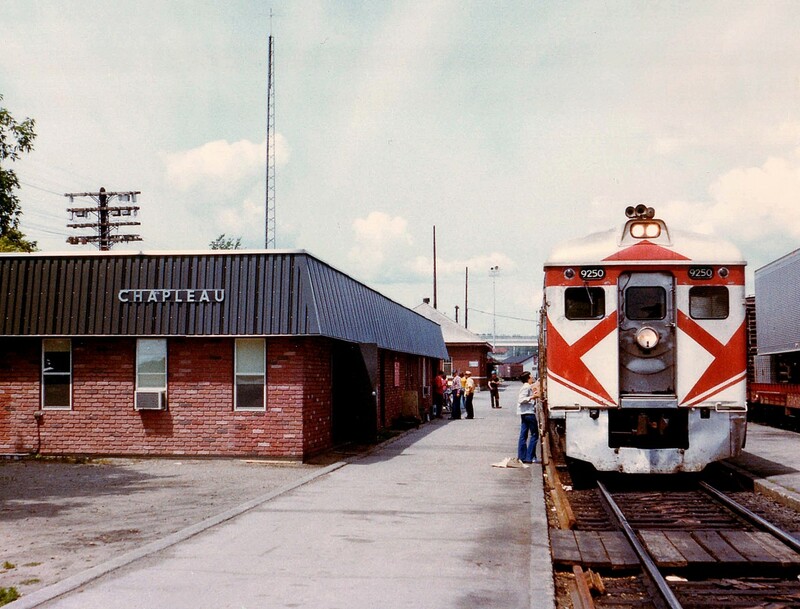 Caption: CP Budds 9250 and 9024, tri-weekly #185, seen here at a station stop in Chapleau on their run from Sudbury to White River in this pre-VIA image. The train has just left the Nemegos Sub and is about to enter the White River Subdivision to the town of same name 130 miles down the line. VERY observant, Mr. Vincent!!! You are indeed correct and I deserve a whipping with an exposed film strip. I had it all backward. I knew it was Sudbury-bound, but for some reason was reading my old TT backward. Excellent scene in this photo, but it looks like your train is actually 186, eastbound towards Sudbury, just having traversed the White River Sub and about to enter the Nemegos. For comparison’s sake I’ve just uploaded a photo from the same location in 2013. As of 2010 both buildings captured here were still standing. The one in question still has the “Chapleau” lettering on it too! I like this shot Mr. Mooney; is that station building still standing? It is a good example of what was built in the 1950′s.